Traditionally, shino-glazed works are fired in reduction kilns—as a reducing atmosphere must be created for iron to be drawn into the glaze from the clay surface—unless the glaze is formulated with sufficient iron. A range of white to burnt-red shinos can be created that work for cone 6 electric firings and are aesthetically reflective of traditional Japanese crawling shinos. Shino glazes are incredibly non-toxic wonders of the reduction world that typically require no metal colorant for their diverse range of visual effects. The variation of burnt red to orange to gray/white with blushes of pink, peach, soft maroons, or even iron spots moving through the glaze to the surface has seduced many potters over the centuries. Modern shinos are fired in a gas reduction kiln (see 2), rather than traditional, wood-fired anagama kilns. When trying to adapt or recreate a shino glaze that will work in an electric kiln, the ability to pull oxygen out of clay surfaces and thus create a movement through the glaze is not viable in electric kilns. To that end, most commercial cone 6 oxidation shinos are not shinos at all; they lack the acquisitioned iron content from the clay body to be orange where thin versus white/gray where thick. Instead, commercial, cone-6 shinos depend on opacifiers and surface effects for color—emulating actual shinos through clay surface textures that force these glazes to break around and pool between them. Many commercial shinos use expensive ingredients and have used limited supply clays (Alberta/Albany) to recreate what feldspar, soda ash, and kaolin (and small quantities of spodumene) do in reduction. Shino: A glaze that is most commonly associated with Japanese aesthetics. The original Japanese recipe includes ground high-alumina, high-sodium feldspar and local clay. Most American recipes are derivations of Virginia Wirt’s work in the ‘70s (a student of Warren MacKenzie) and include a blend of soda ash, spodumene, feldspar, and clay. Crawling: An undesirable effect in most glazes and a highly desired one if controlled in shinos. Crawling exists when a glaze shrinks and peels back on itself, either beading up or resembling cracked mud with textures and mottling on a surface. This is often due to kaolinite shrinking from water loss and gassing off of soda ash during the firing. Emeralding: Formation of emerald-green soda glass—when soda piles up on a surface such that an emerald, jewel-tone color becomes visible. Soda Ash: Soda ash, Na2CO3, is a known flux, soda source, and is responsible for color, surface textures, soda glass, and emeralding in soda firing. In shino glazes, it can trap carbon, form spots, contribute to blushing, and largely dictate surface aesthetics in reduction firing. The simplest cone-10 shinos consist of 60% high-aluminum, high-sodium feldspar and 40% EPK kaolin. To this base recipe, spodumene is added to further vitrify the glaze and to reduce the amount of crawling that takes place when EPK kaolin loses water during firing and shrinks, forming the “dried mud” aesthetic. Along with spodumene, soda ash (Na2CO3) is added as another (and aggressive) flux. Soda ash is a salt and has a unique role in shinos. With anywhere from 4–16% soda ash, soda-salt crystals form on the surface of the glaze and can contribute to spotting, blushes, and carbon trapping. 1 The base Visual Arts Center Shino recipe, with incremental glaze thickness and the corresponding patterning and crawling. Tile A dipped once; tile B dipped twice; C dipped three times. Using this information as a guide or reference, a properly stable and vitrified shino base can be developed for cone-6 oxidation firings. To achieve some degree of surface crawling for traditional Japanese shino aesthetics, the ratio of non-calcined EPK kaolin needs to be kept relatively high, while the remainder of the glaze base stabilizes and vitrifies the high kaolin content. In figure 1, a series of tiles are prepared from an adjusted cone-6 shino base. Note that although the glaze is thin on the edges and on an incredibly high-iron-content clay (Brooklyn Red), effectively no iron is pulled into the shino, thus an orange or burnt red blush isn’t formed. Of these, tiles 1A and 1B show a good white shino base for cone-6 purposes. Note that of the three tiles shown, the first is a thick single dip, the second is a thick double dip, and the third is dipped three times. Crawling segments increase in size until they begin to peel back and away from the surface, as seen in tile 1C. This is important for preparing surfaces with this glaze. 2 Mug with Gustin Shino, fired in a reduction kiln to cone 10. Using the white shino base above, incremental amounts of red-iron oxide (RIO) can be added to tune the color, as iron isn’t otherwise pulled up into the glaze from the clay body in an oxidation atmosphere. In figure 3, a gradual transition from white to terra-cotta colors is observed with added iron content ranging from 0–5%. It should be noted that as red-iron oxide is added, the glaze is more aggressively fluxed, such that the shino texture, crawling, and composition of the glaze are somewhat lost as a function of increased color intensity. 3 The Visual Arts Center Shino base recipe, with incremental additions of red-iron oxide (0–5%) for increased color. With the white/tan (0–1% RIO) and red/orange (4% RIO) shino bases above, combinations of shinos (and cone 6 tenmoku liners) can be used to create a variety of finished effects, ranging from blushes to subtle undertones (4). These can be achieved by techniques including layering, dipping in different combinations, and even spraying for emulated blushing effects, similar to that of an atmospheric firing. For the two cups, the white shino base was used first, with the 4% RIO mixed orange shino sprayed on top of the white layer and fired on a fast setting to cone 6. The more vitrified red-orange shino fluxes the surface of the white shino where it crawls, rounding the edges of the cracks and emulating a heavily crawling, flashing, reduction shino surface. 4 Ryan Coppage’s two yunomi that were first dipped in Visual Arts Center Shino base, sprayed with the 4% red-iron oxide base, then fired to cone 6 in an electric kiln. 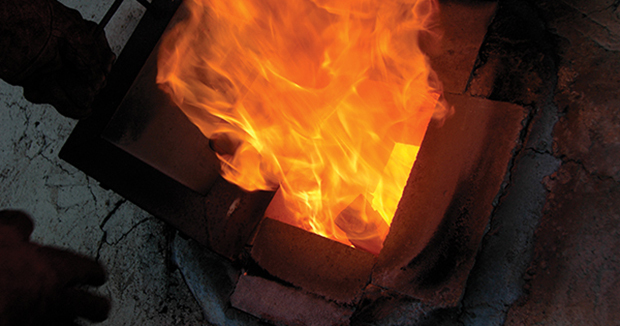 To this end, the aesthetics of a colored, crawling shino are no longer exclusive to just a reduction or wood-fired kiln; they can be recreated in cone-6 oxidation using kilns in your garage, backyard studio, or in a modestly budgeted community arts center with a couple of electric kilns. The development of these glazes was a mentored glaze design project of two students at the Visual Arts Center of Richmond, Matt Drabenstott and Sandra Carolan-Brozy. the author Ryan Coppage is currently chemistry faculty at the University of Richmond. He teaches a Japanese Ceramics and Glaze Design class at the Visual Arts Center of Richmond and still makes far too many pots. To learn more, www.ryancoppage.com. Click here to read Black Shino by Mel Jacobson and A Shino Analysis by Tom Buck. These articles originally appeared in the December 2000 issue of Ceramics Monthly. anagama, bases, clay, crawling, flashing, iron, kaolinite, oxidation, red iron oxide, reduce, reduction, setting, shino glaze, spodumene, spraying, tenmoku. Clay Culture: Are Kilns Obsolete?